Discharge is a specialty ink used in screen printing. It results in very soft hand, showing the shirt's natural fiber instead of laying a thick layer of ink on top of the shirt, and can be printed as pure discharge or with pigments added so that the result is a colored discharge print. By itself, discharge ink removes the dye of the cotton fiber when it hits a certain temperature. It works with a variety of different brands and styles of t-shirts or other garments, with some styles and colors having stronger results than others. After being washed you will not be able to feel the print on the shirt, which will be alot more comfortable to wear. 100% cotton shirts have to be used with this type of printing. This technique is especially popular with clothing lines and is very common in retail stores. There are definitly a couple of things to understand when doing discharge printing, the main being that mid-blue tones(royal,turquoise,etc) and purple do not produce bright discharge prints and there is no true way to match pantone numbers because of the process itself. 4 color process printing is a technique used to produce full color prints. The 4 inks used(cyan,magenta,yellow, and black) are more transparent therefore can blend together creating other colors. Simulated process printing is a technique that is somewhat similar to process printing, the difference being that you use more opaque inks. The end result is a more vivid print than the basic process print, and the overall feel of the print is usually a softer and thinner feel than traditional spot color printing. We prefer this method over basic process printing. Exactly as it sounds, this is the most common type of printing you see. We accept many different file types, here is a list. It is extremely important to understand that these files need to be high resolution. 300dpi or greater and at least close to actual print size. They need to be as clean and crisp as possible to produce the best possible print. We can work with you if your file is at least close to 300dpi but we will need to examine the file first to be sure we can work with it and make you happy with the results. Vector formats are always the easiest files to work with and usually produce a very good end result. If you are using CorelDraw you can export as a EPS or PDF an send it to us. Be sure to convert alltext to outlines or curves before sending the files to us in case we dont have the font you have used. 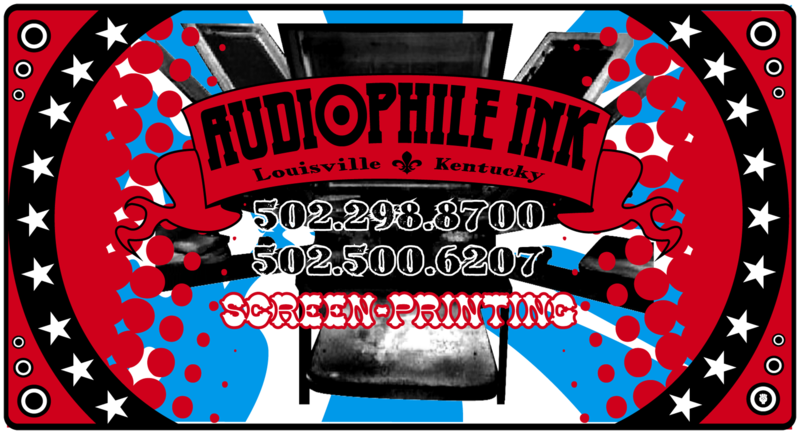 Copyright 2011 Audiophile Ink,LLC. All rights reserved.